NFMT is free to attend. Your registration includes access to more than 125 educational sessions, entry to the industry's largest FM Expo Hall, facility tours, networking events and the opening night networking party. Join us on Monday for in-depth workshops. You have the option of adding pre-conference workshops and a 12-month membership when registering for NFMT. Do I need to register for the Smart Building Innovations Conference separately? No. Your NFMT registration includes access to the SBIC conference sessions and expo. A must attend event every year. Exclusive access to over 30 full-length conference session videos filmed in Baltimore, posted for members approximately 1 week after the event. Access to the NFMT video archives—more than 100 previously filmed presentation from previous NFMT conferences in Baltimore, Las Vegas and Orlando. It's the most robust FM video library you available today! Just a reminder, your NFMT membership gives you the same great opportunities and offerings at other NFMT events throughout the year. Join us at NFMT Vegas November 6-7. Sign up today for only $99. If you plan to attend NFMT, add the membership during the registration process. 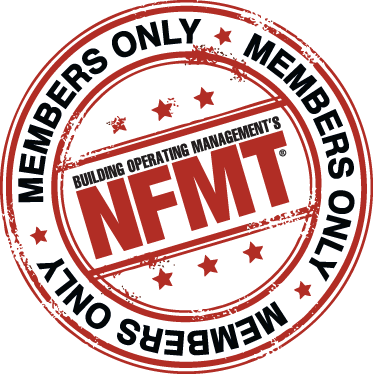 If you have already registered for NFMT you can become a member here. To check on the status of your membership please contact Steve Soller at 414-228-7701 ext 454 or steve.soller@tradepress.com. $99 for a 12 month membership.